Saw an ad in a newspaper today that caused our jaw to drop. We checked with our friends at the other end of the room who are the voices of the Brownfield Network, the nation’s largest agriculture radio network and they also were stunned. One that we always thought of as a cultured young woman uttered an unladylike three-letter exclamation. Then the ad prompted some discussion. It has a faux fur collar. We’ve come to understand “faux” is a toney word for “fake.” Figured that out a long time ago. The Sturgis Police Department better have its Pentagon-surplus armored vehicle ready to go rescue that guy. Or woman. Women can be big and burly sometimes too. So the newsroom conversation started. 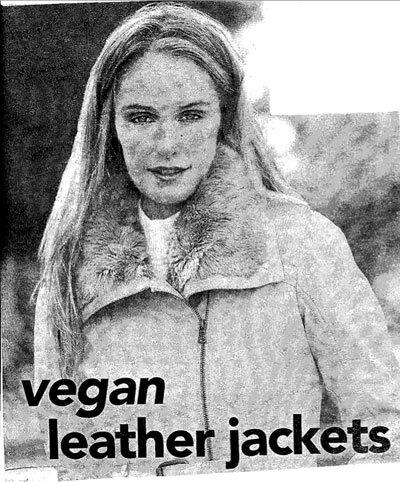 Does the average vegan have enough skin to make a jacket out of? Or does it take several? Are these domesticated vegans, farm-raised vegans, free-range vegans, or maybe grass-fed vegans? And does the Agriculture Department or the Conservation Department have regulatory authority over captive vegan operations? We’ve seen a few pretty hairy vegans. Do they really need to have a “faux” collar on this jacket? It would be a shame to waste the rest of the creature just for the vegan skin, as our forefathers wasted whole buffalo herds just for their hides. So what does vegan meat taste like? One of our friends suggested it probably doesn’t have much taste and it’s probably not well-marbled. In fact, he suggested it probably is about as tasty as raw granola or maybe shredded wheat. It probably wouldn’t work well on a barbecue grill because there’s no suet to hold it together–kind of like some moose meat I tried to turn into barbecued burgers one night only to see it all crumble and fall into the charcoal below. We recognized leather likely comes from cattle. So what do you suppose–with the understanding that a Vegan is a Vegetarian who doesn’t even drink milk–a vegan cow looks like? But maybe that’s the answer to our problem. Perhaps only something as oxymoronic as a vegan cow could produce something as oxymoronic as vegan leather. But Ye Gad!! Think of what’s next. After all these years we still haven’t figured out what a Nauga looks like. Now we have to figure out what in the world produces vegan leather. This is what happens on a slow news day when there’s nothing particularly significant to occupy our minds. If you’re a Vegan (and we have some friends who are and we like them a lot) who feels we have unfairly picked on you, blame Christopher Columbus. Without him, there wouldn’t be a holiday; there likely would be news to cover and we likely would not have been trolling through a newspaper to see this ad.